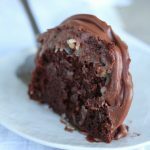 My recipe for Best German Chocolate Bundt Cake will take your confidence in baking to the next level! Best German Chocolate Bundt Cake takes the mystery out of making this special occasion treat in your kitchen. Does the thought of making a German Chocolate Cake at home intimidate you?? German Chocolate Cake is a cake people tend to buy, but not make at home. Maybe it’s the thought of making a cake, and a topping, and frosting that compels us to buy from the bakery, instead of baking at home? I’m going to share with you my simple, make-ahead version of Best German Chocolate Bundt cake that will knock your socks off. This cake’s simple, gooey, moist deliciousness will convince you to never, ever, buy a German Chocolate Cake again! Why a German Chocolate Bundt Cake? Years ago, I made a 100% from scratch German Chocolate Cake for Grant on his 50th birthday. I love that recipe! The only problem is, the cake takes a bit of time to make and is a little on the difficult side to handle if you are a novice baker. I wanted to create the Best German Chocolate Cake recipe that is simple for a beginner cook to make and also give instructions for make- ahead so the cake can be made ahead, along with the topping and frosting, and assembled later if needed. With that in mind, I thought what’s easier to make than a Bundt cake?? How about a bundt cake made with a cake mix as a base? I knew you’d agree. That’s how the Best German Chocolate Bundt Cake was born. Best German Chocolate Bundt Cake can be made in stages, so you won’t get overwhelmed with all three steps at once! 1. Mix and bake the cake. 2. Make the coconut-pecan topping, refrigerate. 3. Make the frosting, spoon into a bag, and refrigerate. If you’re pressed for time, you can make the Best German Chocolate Bundt Cake up to two days in advance. Once baked, cool and wrap with plastic wrap and stick in back of fridge so no one will eat it up before you have a chance to frost! The topping takes about 15 minutes start to finish, and can be stored in a bowl in the fridge. Make the topping and frosting up to a week before serving. Again, store in the fridge until ready to assemble. When you’re ready to assemble, take everything out, and follow instructions on recipe. It is best if the filling and frosting ingredients sit out on the counter for about 30-45 minutes before using to come to room temperature! Remember, if you are making ahead, hide the cake or you won’t have anything to frost. Where’s my laughing emoji?? I have a problem with eating unfrosted cake. Like an- I need an intervention type of problem… Oh, and I’ve added instructions to make this in a sheet pan if a sheet pan works better for you than a bundt pan. Turn oven to 350 degrees and place rack in middle of oven. Place the wet ingredients into a large mixing bowl and mix until blended well. Add the cake mix, box of pudding, unsweetened cocoa and sugar. Mix for about 2 minutes on medium speed or until blended well. Turn beater on high for about 1 minute. Pour the cake batter into the pan and bake for about 45-50 minutes or until the cake springs back when touched lightly. Remove from oven and let cool for about 5 minutes, then turn cake out onto cooking rack and let cool top side down until completely cooled. Beat Evaporated milk, egg yolks, and vanilla in a large sauce pan with a whisk or fork. Add sugar and butter and cook over medium heat for about 10-12 minutes until mixture is thickened and starts to turn a golden color. Whisk while cooking every few seconds. When the mixture has thickened, remove from heat and add coconut and nuts. Set aside to cool. Place in a bowl and set in refrigerator until ready to use. Beat cream cheese and butter in a large mixing bowl until smooth. Add powdered sugar and cocoa powder and beat on low until smooth. Add vanilla and pinch of salt. Using large Ziplock bag, or cake decorating bag, placing the bag inside of the cup or small bowl. fold the ends of the bag over a cup, and fill the bag with the frosting. Squeeze the frosting to one end of the bag. Snip off a small end of the bag when ready to frost. Place the cake on a flat plate or cake stand. Top the cake with the coconut pecan mixture using a spoon. Using the bag of frosting, pipe the frosting onto the cake until all of the frosting is used. You may also fill two bags and snip off one large and one smaller opening if you want to achieve a look similar to the one in the photo. -The key to getting a bundt cake to come out of the pan in one piece is not flour, but lots of oil coating the pan. I use cooking spray. Just a basic PAM spray. Spray on more than you think you need. Two coats. don't forget the middle of the pan. -You may use any brand of cake mix, I usually prefer Duncan Hines, or in this cake Betty Crocker. -Do not mix the pudding with milk before adding to the cake. -Start in the middle and work your way outward when piping on the frosting. -Because the frosting is made with cream cheese, store in fridge if there are any leftovers. -This cake may also be made as a sheet pan cake! Simply follow directions and bake in a standard sheet pan for about 20-25 minutes or until top is set and springs back lightly when touched. I advise making 1 1/2 of the pecan and coconut filling. The standard amount in the recipe for the bundt pan works, but needs to be carefully spooned on to make sure there is enough filling to cover the surface of the sheet pan cake. For frosting, you may spread on the frosting on top of the pecan coconut layer, or thin the frosting a bit with a few tablespoons of milk. After thinning out frosting, spoon into a pastry bag or a Gallon Ziplock bag with the corner cut off. Drizzle on top of cake using a back and forth motion from one end of the cake to another. Refrigerate cake until ready to serve. Hi Si, I am wondering if a german chocolate cake mix would work for this recipe or is the chocolate cake mix best? Have you ever tried making these in cupcake or muffin form? I wondered on bake time just made the cake for Father’s Day and it was the best cake I’ve made so far! Thanks! I made this for my mother in laws birthday! It was a hit! I made the cake in the AM, the topping in the afternoon, and I made the icing and decorated it in the evening before the event! I grabbed some flowers on clearance and popped them in the middle to hide my less than perfect decorating capabilities;). The cake was delicious! My sister requested German Chocolate for her birthday. This was by far the best cake I have ever made. Thanks for the recipe. Do you have a favorite cocoa powder? What if you use milk instead of water? no need to use milk, it is already in the cake mix! I’m excited to try this cake for the holidays!! But I’m confused when you say ½ cup unsweetened cocoa and 1/4 cup unsweetened cocoa powder? Is it the same thing? Or what do I need to buy? Hi Ciji, I adjusted the recipe to avoid confusion, the cocoa powder is unsweetened cocoa powder for both the cake and the frosting. Happy baking! Hi Janet, the flavor is chocolate. Hope you love this! I was wondering if the coconut pecan mixture will stay on top of the cake (not slide off) if I decide not to use the frosting? I made this for our Christmas dinner. It’s great! I love German chocolate cake. Have never had it with frosting just the coconut pecan and always a layer cake. I didn’t use as much frosting as you show on the picture, but it was still very good. I mean what could be better than chocolate cake, coconut pecan, and more chocolate in the frosting, right. The cream cheese in it made it super delicious. I was excited to see a bundt version as at the present I don’t have layer cake pans. Only thing was I accidently got regular pudding not instant. It was still very moist and one of the best cakes I’ve had. I will be making this one again! Thanks for the recipe, I shall be passing it along to friends and family. German Chocolate is my absolute FAVORITE! If the cake mix is labeled with pudding already in the mix, do you still add the instant pudding to the mix? Yes, still add the box of pudding! This is the best thing we’ve ever eaten!! My fiancé’s family is from Brazil and are all very world traveled and foodies. I’m always nervous taking food to them and they all went nuts over it. NONE was left and it’s very filling. I used the German Chocolate mix and condensed milk instead of buttermilk (accidentally lol). I also used coconut flavoring instead of vanilla in the icing and that was fabulous too! We were eating the coconut mix right out of the pot! Annie, I’m glad you loved this recipe! It is one of our favorites. Im sure the coconut flavoring was delicious! Ill try that next time. Thanks for reading ABK! I made this cake tonight. I do a “cheaters” version for the topping. One can dulce de leche and one can cream of coconut mixed. Split in half and mix in 1 1/2 cups coconut and 3/4 c cup pecans. Store in fridge and spoon on chilled cake. The ‘cocomel’ sauce is great over ice cream as well. Oh wow! what a great substitute in a hurry. Thanks Jeni for sharing this! The way the recipe is written, the advertising comes in at the end of the cake ingredients but after the advertising there is an additional cake ingredient…sour cream. Easy to miss…so don’t make the mistake I made and leave it out. I’ll let you know how the cake is without it. Thanks for the heads up! So sorry about this. I will look into the ad covering the recipe! This cake looks fabulous! Because of timing I was wondering if this cake can be frozen once baked and then taken out to add the coconut mix and frosting before serving? Claire, Absolutely, this cake freezes well and can be prepared ahead, cooled completely then frozen. Yes, it will be fine on the counter for a few hours, maybe 6? I try to assemble it before hand and the refrigerate for best results while cutting. That said, if you don’t have enough room in your fridge, a few hours on the counter will not hurt! I made this for a dinner party. It was very good, but I felt the frosting needs a tweak. It’s just probably a preference, but following the recipe I thought the frosting was a bit bitter. I added more butter(unsalted) more salt and 2-3 teaspoons of vanilla. With that, I’d say this was a big hit. Thank you for the bunt version! Thanks you for your tips on improving the frosting. I’m so glad you liked this German Chocolate Bundt Cake. I just made this for our Sunday dinner and I got a 10/10 from the “judges!” 🙂 Thanks for the recipe, we all loved it! I’m always so glad when a recipe receives such positive reviews! Thank you for letting me know and thank you for reading ABK! This was so delicious! If I can come up with a yellow/vanilla cake version, this will be my go-to cake base! yes, if I were making this into a three layer cake, I would double the coconut filling layer. If as a two layer cake a single recipe will be sufficient. What a nice sister you are! Let us know how it turns out! This was so incredibly delicious! A big hit. Thank you!! Thanks so much Jodi! We love this cake too. Oh wow. This was the absolute best German chocolate cake recipe I’ve ever made. I made it in 2 9inch pans. Doubled the Pecan frosting used it in the middle and top of cake. Then I iced the sides with the dark chocolate icing. Everyone raved about it. I will make this again. Thanks so much! Loved hearing how you turned this into a layer cake! Thanks for leaving detailed alterations to the recipe. Im going to give it a try soon. I was thinking of making it in round 8in pans to make a layered cake, how long would you cook it for? Also would the same amount of cake batter be sufficient for two 8in by 3 in pans? And how full would you fill each pan? 8 inch pans usually cook from 25-35 minutes depending on your oven, so keep an eye on your cake! Try filling the cake pan half full. Let me know how this recipe works for you! Thanks for reading ABK. I want to give this recipe a shot as a white cake. The chocolate was so amazing. Have you done that already? I love the pudding and sour cream in the mix. It just makes the cake so moist and the right anount of dense! Thank you! Use Cake Release instead of vegetable spray to coat your Bundt cake pans. You will be so glad you did. Here’s the recipe I use: 1/2 cup of solid shortening (like Crisco), 1/2 cup of vegetable oil and 1/2 cup of all purpose flour. Mix until thoroughly combined. Use a pastry brush to spread in cake pan instead of greasing and flouring your cake pans This will keep up to 3 months , unrefrigerated, on your pantry shelf. Thanks for the baking tip Sharon! This cake was amazing. I made this for a girlfriend’s birthday at work. Not a crumb left! I had people going for seconds, and scraping up the topping and frosting. 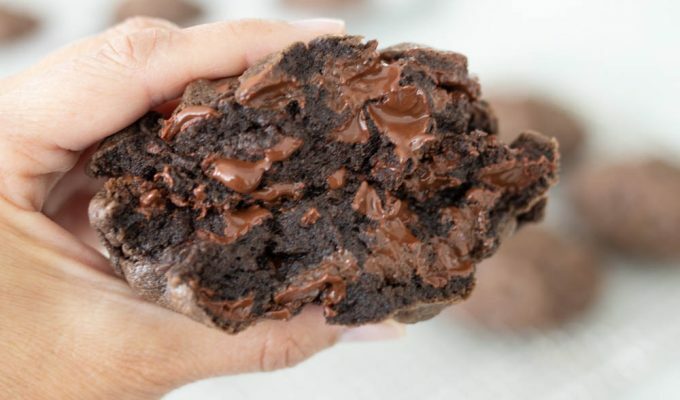 I like that you can use your favorite chocolate cake mix. I of course am a chocoholic, so I bought a triple chocolate cake mix…YUM! What size of bundt pan do you use? Hi Mark, I usually use a 12 cup bundt pan. Thanks for asking! What do you mean by “small” box of pudding? I saw a few different sizes at the store, & I wanted to be sure I got the right amount! Jello pudding is usually sold in two sizes, 3.4 oz and 5 oz. This recipe calls for the 3.4 oz size. Thanks! Hi Angie, I think it would turn out great using two 9″ rounds. I haven’t tried it that way, but it may bake through a little better. Thank you for asking and for reading ABK!